Wishes. Little pigs. Colors of the flag. Musketeers. Pieces of suits. Dimensions. It’s undeniable that the universe is ruled by the number 3. And just like the three magical ingredients in a BLT, it only takes three numbers to make a winning combination when you play Carolina Pick 3. If it sounds easy, it’s because it is: Pick any three numbers between 0 and 9, choose from a handful of play types and how many times you want to play, and you could win up to $500 in two daily drawings. And with the 1-OFF play type, your three numbers can be one off the numbers drawn and you STILL win. Or, for the aspiring mathematicians out there, add Sum + It + Up to your ticket and win when your numbers add up to the winning numbers! What other game let's you win even when the numbers drawn aren’t the ones you picked? With so many ways to play, the only wrong choice is not making one. Pick three numbers from 0 to 9. Exact: Selected numbers must match winning numbers in order drawn. Select the drawing time you want to play. Choose day draw (approx. 3 p.m.) to play daytime draws only. Choose evening draw (approx. 11:22 p.m.) to play evening draws only. Choose both draws to, you guessed it, play the next available day and evening draws. Two separate Pick 3 tickets will be generated: one for daytime drawings and one for evening drawings. All plays selected will be for the next scheduled (most current) drawing only, unless you choose Multidraw or Advance Play. Multidraw: Play up to 7 consecutive day or evening drawings. Advance Play: Select specific future draw days excluding the current day. 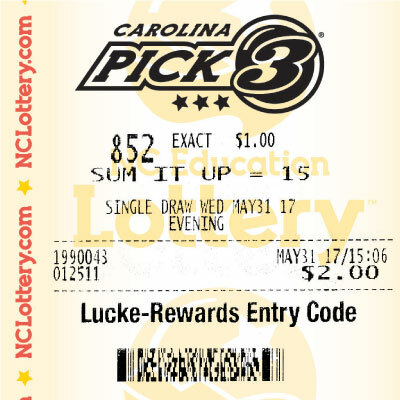 Your Carolina Pick 3 ticket can be canceled by the retailer on the terminal where it was produced within 15 minutes of the purchase time or within the remaining time before the draw break, whichever occurs first. The Pick 3 top prize is won by matching all 3 winning numbers in the exact order drawn. The numbers you select determine the ways to win. *50/50 Exact match payout includes the "Exact" portion plus the "Any" portion. The sum of your numbers gives you another way to win! Let’s say you play Carolina Pick 3 and select the numbers 8-5-2. The sum of those numbers is 15. Then, if the numbers 7-6-2 are drawn, you win the Sum + It + Up prize because 7+6+2=15. You do not have to match the Pick 3 drawing numbers to win on the Sum + It + Up feature. 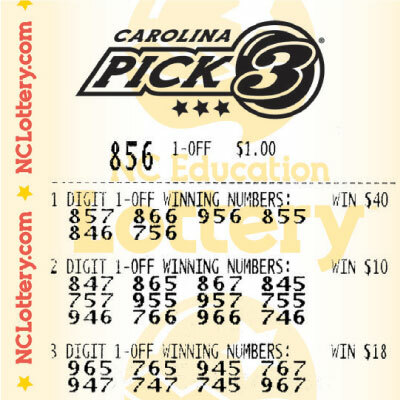 Select your three numbers for your Carolina Pick 3 ticket and a play type. Mark Sum + It + Up on each panel that you want to add Sum + It + Up to. Each addition of Sum + It + Up will cost an additional 50¢ when added to a 50¢ Pick 3 play and $1.00 for a $1.00 Pick 3 play. Sum + It + Up can be played for both day and evening drawings. How much you can win playing Sum + It + Up depends on whether you play for 50¢ or for $1.00, as well as the odds of winning for your sum. See the prize chart for exact payout information. The top Sum + It + Up prize of $500 can only be won by playing 0-0-0 or 9-9-9 for $1.00, adding Sum + It + Up for an additional $1.00, and matching the sum of the numbers drawn. Odds vary based on the numbers played. Odds of winning SUM IT UP range from 1 in 13 to 1 in 1,000. Well, 1-OFF is the play type for you. You win a prize if one or more of the numbers you selected are one up or one down of the numbers drawn. 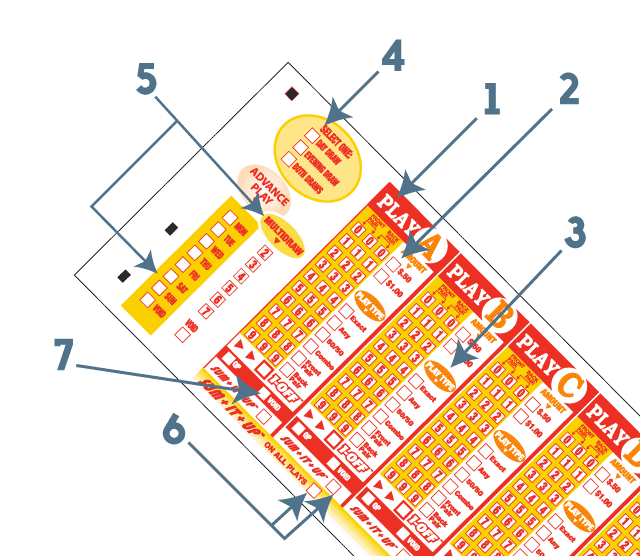 After you pick your 3 numbers on your Pick 3 ticket, select the 1-OFF play type. Only one play type may be selected per panel. Pick 3 with 1-OFF gives you 26 CHANCES to win based on numbers selected.